The surface of the earth changes inexorably. Water and wind constantly erode the skin of our planet and alter its countenance. Forms, surfaces and structures come into being in endless diversity. Unique, entrancing works of art, characterized by a beauty and quintessence such as only Nature can create. Nature is our model – both inspiration and standard for our endeavors towards innovation and perfection. 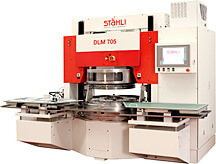 Stahli is one of the leading companies worldwide in the manufacture of flat honing, lapping, and polishing machines. To our customers, we are known just as much by our standard products as by our custom-made and need-oriented special products. Our special know-how results from decades of daily new assignments in contract work and the support of our expert and committed workforce. We are happy to pass on our know-how to our customers within the framework of contract work, tests and complex or experimental project studies. Put to test our reliability and innovative dynamics. See one of the most modern machine show rooms in North America! Discover how some of the industry’s highest-precision machined components attain the ultimate in flatness, finish and size. Tour one of the most sophisticated polishing labs, contract and research facilities in the United States now!